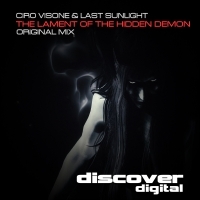 With a title of The Lament of the Hidden Demon you would be right in expecting something special, then one look at the artist and you see it's another quality Ciro Visone collaboration, this time with Last Sunlight and you know thats you are in safe hands. The tune starts with a sinister menace as it drives full pelt towards the breakdown with a detuned acid and bags of production trickery before the breakdown opens up with unexpected yet beautiful melodic warmth. The tunes pedigree shines throughout, never more so then when the break kicks back in to lift everything sky high and beyond. This is very definitely big trance with Ciro Visone and Last Sunlight more than delivering the goods. 'The Lament of the Hidden Demon' is available now from Beatport and iTunes.